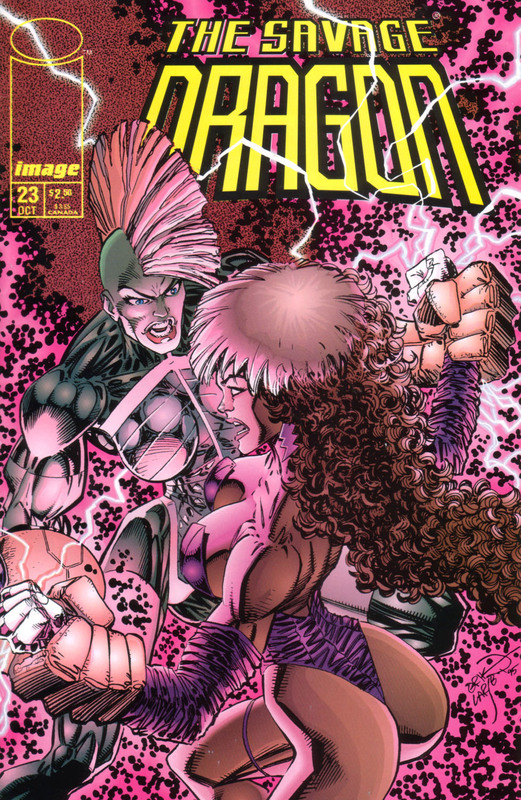 She-Dragon has a new look after having grown her hair back in the form of a Mohawk and she is now in possession of a pair of power gloves that augment her superhuman strength. She wishes to once more try out for the Chicago Police Department and ignores the voices in her head telling her not to. With all of her friends still being locked up in prison, She-Dragon has nowhere else to go and presses on. Captain Mendosa makes his first address to the Chicago Police Department to announce that it has been two weeks now since Dragon went missing. He was last seen leaving Rapture’s apartment and a thorough search around that location has turned up nothing. The Turtles are wanted so that they can assist the investigation but they have had no luck locating them. An upset Rapture is comforted by some of Dragon’s closest friends on the force who assure her that her boyfriend is fine. Rapture apologises for the way she has treated them all but cannot help getting overly protective and aggressive when it comes to Dragon. Phil Dirt begins to worry himself over the disappearance but Alex Wilde quickly quietens him down. Rita Medermade makes an innocent comment which instantly brings back Rapture’s abrasive nature. With OverLord’s passing, several villains gather together in a Vicious Circle stronghold where they debate who should be the new leader. BrainiApe declares himself the only worthy successor which causes DownLoad to dismiss this notion. A fight breaks out between the pair which BrainiApe wins as former members of the Annihilators watch on. Dung comments that despite his proclamations, the Vicious Circle are not going to follow BrainiApe who is essentially just a talking gorilla. She-Dragon arrives at the precinct to see Captain Stewart and is quickly informed of his passing and the instalment of Captain Mendosa in his place. Her attempts to get recruited for the police are rejected before she can really ask. She-Dragon hears that Dragon has gone missing and when she notices that Rapture is in the building, she asks her to help her audition as a replacement for Dragon. Rapture dismisses the challenge and when provoked further she simply electrocutes She-Dragon unconscious. She is then approached by Peter Klaptin who had come to the precinct in search of Dragon to discuss a secret of his that was recently revealed. Rapture is aware of that revelation too and she plans to take advantage of this knowledge to blackmail Peter for her own gain. Peter Klaptin emerges from a previously locked room, adjusting his clothing. Rapture follows him out and assures him that his secret is now safe with her. She-Dragon returns for a rematch with Rapture and strikes her down. Their fight escalates until they have burst outside into the street. Rapture removes the power gloves before shocking her opponent once again. She demands that She-Dragon abandon her codename and give up on joining the police or else she will kill her. Rapture then storms into the office of Captain Mendosa, throwing down the seized power gloves. She accuses him of not even caring that Dragon is missing and that he believes Dragon is more trouble than he is worth.